Hard Hat Stress Balls Design Hard Hat Stress Balls Custom Lanyards with high shine finish that makes them stand out from crowd, a great product for promotional events. Your degin or logo will stand out good due to its shiny finish. The Hard Hat Stress Ball is the ultimate construction promotional item and now available in many great colors! 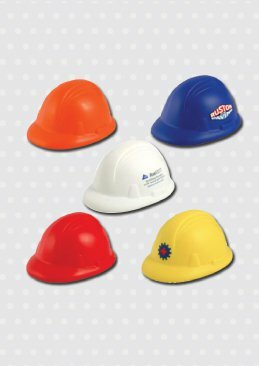 These squeezable hard hat shaped stress relievers are custom printed with your logo and/or text making them ideal for your next marketing or internal event. Being inexpensive, fast to print and loved by recipients you simply cannot go wrong. Order online or contact us by phone, live chat or email for more personalized service. You will soon discover why we are known worldwide as stress ball experts! Size - 3 1/3" x 2 3/4"